From the Library view select the files you want to share. Note that you can select files from multiple folders and even search or refine results. Click Share from the selection drop down. Copy the created link and use in a pdf press release, email to your outside contact, or add to any other application. Add an Expiration Date on the link or make the shared files view/request only. Recipient doe snot need an account to click the link. 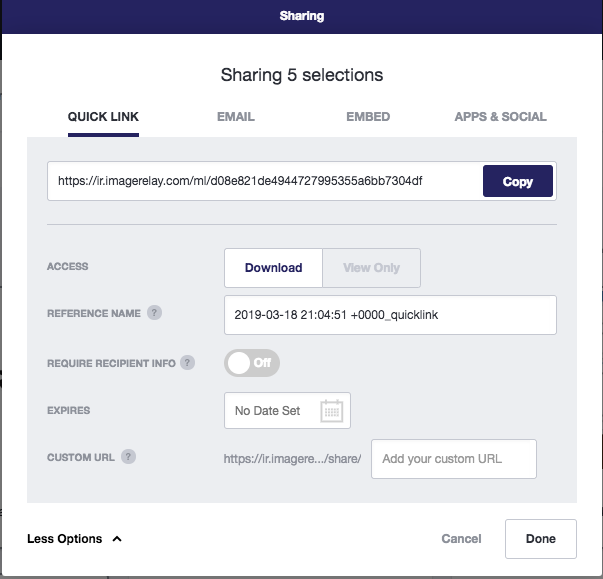 This will deliver your shared files to the end user in your branded download experience, showing sender's info on first look.